I was super curious to start reading Who’s That Girl, as the summary for the book sounded really interesting, and I couldn’t wait to see what it was about. I started reading the book in July, but unfortunately didn’t have a chance to finish it until this week. But, I’m not too far behind, and I did finish the book, so, go me!! Who’s That Girl is full of interesting characters, including the main character, Nattie, who is nerdy and awkward, and totally relatable in so many different ways. She has so interesting friends in her bestie, Tess, two guys named Zach, one who is apparently Tall Zach, and the other is Zach the Anarchist, who Nattie ends up having lots of adorably, as well as painfully, awkward interactions with. Her mom and dad are pretty cool also, and I love her foreign exchange student-brother Sam as well. As I said, lots of interesting characters to get to know in this story! 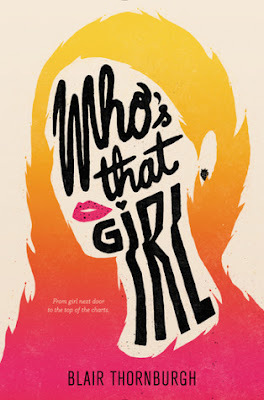 Overall; Who’s That Girl is a quick, fun read, one that I would have normally probably read in one sitting if my schedule had not been messed up this month. It was definitely the characters that made the story for me, especially Nattie and Zach, as I appreciated their adorably awkward interactions so much. I’ll definitely be keeping my eye out for more books by Blair Thornburgh in the future! Another good review! It sounds like I would like to meet the characters in this one. Thanks for sharing. I am with you, the whole song plot was lost on me, because I loved Nattie's friends so much, and found their interactions to be the heart of this book.